Have you ever heard of Direct Business Marketing’s (DBMs) marketing truths? If not, we’re here today to highlight some of them; for a complete list you can always download DBMs online marketing evaluation. First of all, what are marketing truths? DBM’s marketing truths are essentially a set of guidelines that DBM has developed and found that when applied to every campaign that they provide marketing manager services for, it guarantees success. The first of the marketing truths is to build a better bridge to your product. A potential customer may not be looking specifically for your product, but they are looking for your product. A successful marketing manager can help you build that bridge and bring in more traffic and leads to your website. Capture and correspond with your community is the second truth. Essentially this means capturing the potential customer’s information and creating a relationship and community around your customer base. A great way to create a relationship and a sense of community for your business is by taking advantage of social media marketing. DBM offers marketing manager services for this so it’s always something to consider for your business. Another important marketing truth, and one that you’ll want to utilize to generate more traffic to your website, is current content is king. What does this mean? Search engines are continuously looking for new content, so make sure your website is always updated. One service you can take advantage of with DBM is their content submission service. If you allow DBM to be the marketing manager for your content submission, they’ll take care of all the updating for you! Lastly, always be mindful of marketing money. In order to successfully marketing your business you need to track the return on investment for each marketing campaign that you undertake. As your marketing manager, Direct Business Marketing will take care of this for you with all of the marketing services that they provide. To learn more about their marketing services and for a list of all the marketing truths, check out their marketing evaluation on their website. Hi, this is Granison Shines again, the Chief Marketing Officer at Direct Business Marketing. Today we are going to talk about the last portion of our four step process. To recap we have five leads or items and generate the eyeballs for the client type or market type you are going after then push them to some sort of capture source which could be a website, phone call or chat. Then you have to store that data somewhere so that you keep accurate data on how we can nurture. Nurture is one of my favorite parts here because there are so many nuances that can go on. First of all we want to make sure that this process is automated as much as we can so having some sort of auto responder will be very sufficient within your business and tying them to a drip campaign so that you can automatically, based on the number of days you schedule out that you want them to receive emails. Now one of the most important pieces about this is to make sure you immediately start doing that. there are a lot of times when we engage with a client and they haven’t nurtured their database in a long time, then we turn on an email campaign and they have all these unsubscribes. That happens because they haven’t nurtured the relationship at all. So you want to make sure you continue to nurture the relationship at least by automating the process for auto responders. Now, when we talk about nurture there are two different types of nurturing that we can do. One is sales information, but even more important and something you want to do even more frequently is non-sales information. Give them good, useful information that they can use in their business or day to day lives. This is important to nurture the relationship. Nurturing items can be phone calls, you can also do other print depending on the information you captured such as physical addresses. For every sales piece you put out there, put about 7 to 10 non-sales pieces out there. Again, I’m Granison Shines with Direct Business Marketing. You can reach me at 602-369-8119 or you can email me directly at [email protected] Don’t forget to download our free marketing assessment at https://directbusinessmarketing.com/ma. Thanks and I’ll talk to you later. Are you selling your widget or you? This video today is going to cover what you’re selling, which depends on the type of business you have: low cost leader, product innovator or customer intimate businesses. It’s very important to understand that your advertising message is going to depend on the type of business you have. If you’re a low cost leader, such as Wal-Mart or Best Buy, the relationship doesn’t really matter because it’s a commodity product; your advertising is focused more on price. If you’re a product innovator, you’ll focus on the features and benefits of your product, such as Apple, HP, Samsung, for example to help the consumer make their decision based on those things rather than price. When you get to a customer intimate business, it’s all about you. You’re selling you and they’re buying you. The products and services they can get from someone else, but if you sell yourself, they’ll be more apt to buy from you. If you give them good information, then you’re selling you. If you’re a real estate agent, a marketing company, or an insurance agent, they’ll buy from you because you communicate with them and you sell yourself to them. Price and product can be important, but the relationship is more important than those two. If you’d like more information on determining your business type and how you should market your business, please contact me, Granison Shines, at Direct Business Marketing. You can reach me via email at [email protected] or telephone at 602.369.8119. I’d also like to remind you to download our Marketing Assessment from https://directbusinessmarketing.com/ma; our unique marketing assessment can help you determine which type of marketing avenues are best for your business and customer type, so please check it out today. Thanks again for coming to our Get Direct live marketing webinars; I look forward to seeing you next week, same place and time. Hello there this is Granison Shines, chief marketing officer with Direct Business Marketing, thank you for your time today. Today I wanted to talk with you about an important part of properly utilizing your websites found through search engines. Whether through an organic online search or a suggested result it is important to bridge the search or offer gap to best capture your audience. When you have clients who have prospects found through a search engine we want to make sure we bridge this gap between the search engine and the product. The two major parts of this is finding out what your customer base wants and second making sure we provide that in the best possible format. Whatever is being entered in to the search engine is the main focus of your customer and therefore needs to be readily available. Whether your product is found through an organic search or a paid advertisement it is important that we follow through when they land on your webpage. Simply put, the information that was originally searched for needs to be easily viewed in the best possible format. Nothing will throw off potential customers faster than a confusing website that is not directly related to their original product search. In order for SEO to be an important part of your marketing strategy these two simple steps must be followed in order to drive quality traffic to your site. If you have any questions on the value of SEO marketing to your business please e-mail or give me a call today. 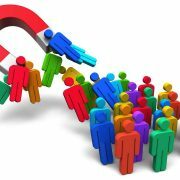 Whether you are developing a new business or just revamping your marketing strategy Direct Business Marketing wants to help your customer base find you fast. Once again this is Granison Shines, thank you for your time and I hope you have a great day. Welcome to another marketing truth video where today we’re going to talk about video and why it’s so important in your online marketing plan. 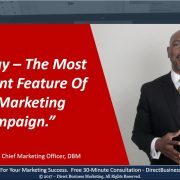 To see all of our marketing truths, go to our website, www.DirectBusinessMarketing.com/webinars, and check out the archive of our marketing truths. There are a few reasons why you should implement using video into your business’ marketing plan. The first reason is simply because people love to watch video. How do we know this? Movies are viewed by billions of people every year and YouTube is one of the most viewed websites on the planet. People like to watch video about all kinds of things and typically people would prefer to watch a video of something rather than read a book. This isn’t the case for everyone as some people do enjoy reading books over watching a video but there’s so much more communication that happens through video as opposed to just reading text on a page. In this webinar, for example, you can see my body language, how I look and there’s much more communication that happens through my tonal and facial expressions. Second of all, people buy from other people that they know, like and trust, specifically in service based industries. People buy from people because it’s a relationship world out there; video marketing helps to facilitate that relationship. Third, video allows you to showcase your expertise, especially if in your industry there might be some complicated concepts that may need explanation or just talking about your industry in general. Video allows you to showcase that expertise, to talk about what you do and allows the potential client on the other end to see your passion about what you do. A fourth reason for leveraging video in your marketing has more to do with a SEO reason, the video show in the search results. As part of the results in Yahoo or Google you see some video options for you to look at. This is known as search convergence, it’s all the search items coming together. Using video is an SEO technique and a way to move your content up in the search engines without actually moving your webpage up. Again, if you’re not using video in your marketing, especially if you’re a service based business, you should definitely be implementing video into your business’ marketing plan. We also have a few things on our website that I would like to bring your attention. First we have our marketing assessment; it’s basically a document you can fill out to help you determine where you should be marketing and help you build a marketing shell for your business. You can find this at https://directbusinessmarketing.com/ma. I’d also like to remind you that every Wednesday at 10am PST we do these marketing minutes where we talk about marketing items and get some good information out to you. Thanks again for coming to Direct Business Marketings Get Direct Webinar. Today we’re going to talk about another one of our marketing truths, Three Things to Tease. Marketing truths are things that we hold near and dear to our heart and have found that as long as we wash all of these over each of our campaigns our success rate goes up. Today we’re going to talk about Three Things to Tease and this specifically has to do with a call to action. The type of marketing we do here at Direct Business Marketing is called direct response marketing. With this, we’re looking to have the prospect do some sort of action as acknowledgment that they’re interested in our products and services. When we talk about teasing in the title, we’re looking to get a call to action in place. For different products we’re going to have different calls to action, but you want to keep these three things in mind. The first thing they are looking for is value added in advance, essentially getting something for nothing. If you can provide value in advance, whether it’s in the form of information, soft offer or even if you have a hard widget, this will help tease the client. The next thing they are looking for is an adequate solution. With most products or services with small businesses they have a problem and they’re looking for a solution. It could be all the way into service industries where you have a more finite product and your customers are looking for a solution to their problem. The other thing almost everyone is looking for is a trusted advisor. They’re looking for someone that can advise them what they should do and what they shouldn’t do. When you’re constructing your marketing and your call to action you want to keep these things in mind. As long as you keep these things in mind your call to action will be that much more effective and is going to convert at a higher rate. Please join us every Wednesday at 10am PST for our free webinars. Also keep in mind that at DirectBusinessMarketing.com/ma we have our marketing questionnaire to help you choose what type of marketing is best for you. Thanks again for coming to our Get Direct Webinar series. Today we’re going to continue our conversation on our marketing truths and your return on your investment. Remember, marketing should be seen as an investment because for every dollar you spend there should be a return, or at the very least a break even. Let’s take a look at being mindful of marketing money. There are three points that I really want to drill into your marketing mindset today. Again, we want to make sure that you see marketing as an investment and that the three points we stress to you today are superimposed over every marketing campaign that you embark on. Remember, advertising is just a piece of marketing and we want to make sure we highlight the following points. Point number one is to define your success. What is the actual level of success that we want to tie the metric to? A lead? A sale? Coming to a web page or getting the client to your physical location? We have to determine what that metric is so we can calculate a return. So, for example, you may get a lead and then your sales process will take over and you can go from there. It’s very important to define your success metric because this is really going to take your marketing campaign to a point of understanding what your prospects are doing so you can measure that. The second point is to constantly track; you have no idea how many times we ask businesses how many times they are tracking this and they are unable to answer the question. There are certain tracking mechanisms you can use to track each of the five different avenues of the marketing campaign. We need to understand whether or not the campaign is working and we can do this by tracking. Point number three is the making sure the Return On Investment (ROI) formula is correct. Generally, the ROI formula is: Gross Profit minus Marketing Expenses divided by Marketing Expenses. You get a ratio, so if your ratio is 5:1 this means that for every dollar you are spending on your marketing campaign you are getting five dollars back. Again, this is a very simple way of looking at your ROI. We want to make sure we define the success metric, make sure we track the information and have the ability to calculate the ROI down to the exact dollar. Please feel free to download the marketing assessment at DirectBusinessMarketing.com/ma. Tune in with us again next week at 10am PST for another Get Direct Webinar series. Thanks again for joining us today. Today we’re going to continue our conversation on the marketing truths, which, again, are expandable mindset techniques of how you think about marketing. They can be superimposed over any type of marketing campaign. Not only is this universally true for every single industry, but especially for your particular industry, you may think that video, for example, won’t work in your industry; we talk about this in the video and tell you why and how you should go about doing this. So, right now I’m going to talk about increasing the income of your business. Nothing happens in terms of business growth until you sell a product or a service. The first way to increase your business is to increase the number of customers that you already have. This is one way we’re always striving to use a business growth method. The second is increase the number of times that you sell to the clients you already have. The third is to increase your prices. When is the best time to increase your prices? Take all three of these into account making sure that you have your thought processes right, you have the products that the client wants and you have the ability to upsell. Again, I ask you when is it the right time to increase your prices. Sometimes you can take a look at market conditions, such as in real estate. Also, look at how busy you are and the clients that you have. You can increase your prices by 10-20% and based on that traffic you’re getting in your facility or website. I wanted to encourage you to join me again next week at 10am PST for our Get Direct webinar series. Also, check out our free Marketing Assessment questionnaire at DirectBusinessMarketing.com/ma to guide you in the right marketing direction for your business. Today we’re going to continue our topic on the marketing truths. This has a lot more to do with marketing efforts and the five major customer mindstays. It’s important to understand if customers are conscious of your company because it has everything to do with how you’re going to be advertising on your marketing materials. If you have a client that comes to your business and they immediately have a thought process about the product and service and want to hear about it,this is the first mindstay; the customer is aware and they have a want. This is probably the easiest customer to sell to. They know they want this product, all they have to do is buy it. The customer is aware, but not in want yet. Your prospect isn’t completely aware of all your product does, isn’t quite convinced of how well it does it or hasn’t yet been told how much better it does. They may want your product, but not just yet; maybe they’re doing some research. A bit more demonstration of the product or service has to be incorporated with a client in this mindset to make it right for them. The third mindstay is when the customer isn’t aware but in want; this is when you introduce a new product. The prospect either knows or recognizes immediately that he wants what a particular product can do. This is where introducing a new product can be a little difficult, so it has everything to do with getting the information out to the public in the right way. A customer not aware and not in want, but instead are in need. This really hones in on a product that we developed called the Short or Stay Calculator. We have this product for homeowners even though they may not want to be out of their house, they have a need that they have to solve; they have to do something with their home. The fifth kind of customer is either not aware of his desire or his need, or he won’t honestly admit to himself without being led into it by your information. This is where the message has to be conveyed to the customer that they need this product. You have to really draw them into your advertising with your headlines or subject of your email. How do you get the attention of this person that’s not looking for this information but you feel they need? This is the most difficult to solve. Where do your prospects fit? When you are writing your ad, it needs to match your prospect’s mindset. If they’re most aware then your ad will be very simple and you don’t have to talk much, but if they’re the most difficult, you need to demonstrate more, have more proof elements and say more. Essentially, you have to bring out all the stops so they know this is a product that they want. We’re going to be talking about our marketing truths. In our business we have a set of marketing truths that we practice our business by. We put all of our marketing campaigns through these marketing truths and we’ve found that when we do that we have much higher success levels. Today we’re going to talk about a specific marketing truth, “Content is King”. This marketing truth has to do specifically with online marketing. “Current Content Is King” kind of comes from the business vernacular that says “Cash is King”; the “cash” of online search engines is current content. The whole point of search engines is to find new content, that’s why when you do searches online, it will tell you how current your search results are. The best way to work with search engines is to give them what they want and in this case it’s current content. People love video; YouTube is always one of the top websites used online on a daily basis. Search engines like text so another key to the “Content Is King” is to provide both video and text content to the viewers that come to your website. We also suggest that you create content on a weekly basis at minimum. Finally, when we talk to clients about this and generating content to be successful, the easiest thing to do is to speak with the people at your business and brainstorm some ideas, such as FAQs and SAQs; if you just sit down and start brainstorming, before long you’ll have a decent list to leverage onto your website. Also, create a schedule and block out some time to create content for your website. Once you have a brainstormed list and a blocked out time, stick to it because you’ll definitely see the results in your business. I also wanted to make you aware of our marketing assessment. It’s a planning document and questionnaire to assist you in your business and identify marketing areas and mediums that you should use. Go to DirectBusinessMarketing.com/ma to download this document. Again, my name is Andrew Houglum and I look forward to seeing you next Wednesday at 10am PST for our live webinar series.